I must admit that whilst listening to the first couple of tracks for the first time, the lovely harmonies and mellow sound didn't appeal to me all that much although I thought it was beautifully recorded and performed but felt it would not prove particularly memorable, at least to me. It just proves yet again that you need to give an album a chance because as things progressed I became more and more impressed and realized that beautiful soft vocals and a mellow sound is only a small, but significant, part of this recording that has far more depth and all round 'edginess' than I first thought. 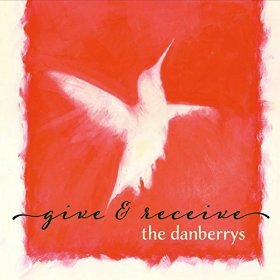 Certainly there is much that is mellow, but the songwriting is excellent and the arrangements are incredibly diverse and varied, to such a degree that the listener can't really pick out what could be a Danberrys signature sound. They are the duo of Dorothy Daniel on lead and harmony vocals, Ben DeBerry, lead and harmony vocals and guitar, with multi instrumentalist and producer Ethan Ballinger playing mandolin, mandola, 12 string guitar, acoustic guitar, background vocals, rhodes, organ and much else besides! Christian Sedelmyer played fiddle on many of the tracks, with contributions from several other talented musicians who all helped to add colour to this excellent recording of ten beautifully written songs. All were penned by the Danberrys, with two being co-writes, six solely by Dorothy and two by Ben. It was recorded and mixed at Southern Ground Studio, Nashville by Brandon Bell with production duties handled by band member Ethan Ballinger. Dorothy has a beautiful voice that is as capable of producing a haunting fieriness as it is beautiful mellow tones and with the ability to not only emote the sounds but also to engender an emotional depth that must be the envy of many singers, on this, their second full length recording following on from an early e.p. Ben also has an excellent voice that in most bands would take the lead but when put up against Dorothys quite exquisite haunting vocals most vocalists would be put in the shade. There is a beautiful manipulative vocal from Dorothy on Lady Belle, a gentle folksy song that has a jazzy leaning and flows serenely along with a cleverly thought out instrumentation on a song that the more I hear it the more I'm reminded of 'Clannad.' Long song is a much more driven song, with Ben on lead vocal with banjo, bass, percussion and fiddle on a composition that has a strong 'old timey' feel that veers towards bluegrass but thankfully avoids the histrionics often associated with the genre. There are some lovely harmonies from Dorothy on a beautifully arranged and performed song that has more depth than many in the same stylistic field. There is a nice slow chugging guitar sound that builds an excellent atmosphere on Don't drink the water, eventually joined by Dorothy's haunting vocal on a powerful tale that has a little darkness in its makeup. It is a lyrically repetitious song, but that is what enables the power and variety of the flowing instrumentation free rein as it evolves and gently changes the depth of the atmosphere. Life worth living kicks off with a strong percussive beat soon joined by Dorothy's soulful gospel influenced vocal on a powerful haunting song, with just the percussion and haunting male harmonies for support. That is immediately followed by another beautiful vocal performance from Dorothy on All the way up, with excellent harmonies from Ben and Ethan on a tale that has great depth and an instrumentation that not only adds to the depth but creates a dark flowing atmosphere as it builds and falls. If I had to criticize this excellent recording it would be to say that the first two or three songs could have been spread across the album because certainly my first impression of them holds fast and doesn't give a true picture of what is to follow. On the other hand; and there always has to be one; perhaps the idea was to lull the listener and create a surprise element as the album progresses. If so, they have succeeded in that. I'm still amazed at the variety of textures and the emotional depth of many of the songs on this tremendous album. I've already voiced my early concerns but this album gradually builds more and more appeal with its variety of sounds, textures and emotions pretty much making those concerns superfluous, in fact they serve to emphasize the fluidity and diversity contained on this excellent recording.